Following the destruction of the Big Ear radio telescope in 1998, and after much effort, our group of volunteers was able to arrange with the Ohio Historical Society (OHS) to produce a historical marker celebrating the Big Ear radio telescope and its creator, Dr. John D. Kraus. We spent much time deciding on the exact wording for both sides of the marker so that the text would fit in the space available. In addition, after we learned we could put one photo or graphic on each side of the marker, we decided to use a reproduction of the computer printout showing the "Wow!" signal for side 1 and an aerial photograph of Big Ear for side 2. We also had to persuade the OHS to allow the text to mention Dr. Kraus by name, because normally the OHS does not allow the text of any of its markers to name a living individual. On November 5, 2000 we held a dedication ceremony; nearly 100 persons attended. Two of our volunteers had installed the marker prior to the ceremony. At the ceremony several persons spoke to the assembled crowd. Documents related to Big Ear were handed out. At the completion of the ceremony, refreshments were served in the library of nearby Perkins Observatory. We learned at this ceremony that this Big Ear marker was the first marker to be erected in Delaware County, and that over 550 OHS markers had been eracted statewide by that time. The cost of the marker was shared half by the Bicentennial Commission (with a grant from the Longaberger Foundation) and the Ohio Historical Society, and the other half by our group: NAAPO (North American AstroPhysical Observatory). Below is a set of links within this website to various documents relating to the dedication ceremony (including photos taken of the speakers and some of the guests), brochures handed out to those in attendance, and directions to the marker. 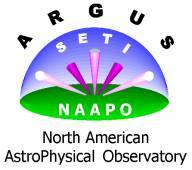 Copyright © 2002-2007 Ohio State University Radio Observatory and North American AstroPhysical Observatory. Last modified: June 13, 2007.